Sentinel Times: Get over Your Fear of the Dentist! Get over Your Fear of the Dentist! Are you afraid of the dentist? Do you consider cancelling your appointment days before, or not showing up at all? Do you feel helpless and uncomfortable in the cleaning chair? If you are, you aren’t alone. Over 75% of Americans experience dental phobia to some degree, 10% are extremely terrified and reluctant to get a dental checkup. That’s a lot of people! In this article, we want to go over why people fear the dentist, and steps you can take to make your visit to the dentist a lot easier on your mind. There are quite a lot of reasons why people develop a bad taste for dentist in their mouths. From harsh dentist personalities, to injury, to terrible experiences, all of these can affect someone starting at a really young age. Most anxieties start at childhood, when as young kids we are learning about the world. Our body and mind are learning about the dangers in the world. 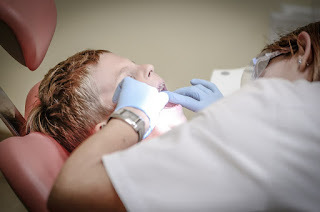 Accidents such as a pick scraping against the gum accidentally or an immense pain when getting a cavity filled at an early age will reinforce the fear of the dentist. Dig into the worst feelings you have personally. They feel terrible don’t they? So why would you go to the dentist when you can just avoid it entirely? Others don’t go to the dentist because they feel like they’re not in control. Having someone you just met and don’t really know too much about be in full control of what’s going on in your mouth is a terrifying ordeal. Feelings of anxiety are often why people reschedule their dentist appointment or skip out on it entirely. Interesting Fact: Humans have an uncanny desire to protect open air passages. We are naturally self-conscious to open up our mouths and exposed to vulnerabilities. We conducted a study, and examined a couple interesting facts about those who have dental phobia. There are some people that choose to eat only soft foods instead of harder foods to avoid chipping a tooth and have to go to the dentist. Others reported dreaming about dentist experiences, and dread sleeping for fear of having these nightmares again. People who have bad cases of dental phobia suffer years on end from toothaches, gum disease, and poor dental hygiene. Avoiding the dentist is much more than what is sounds like. It’s something that can affect your entire identity, who you are, what you value. A dentist visit is a lot like going on a rollercoaster. Lots of people that go to amusement parks find out they have acrophobia, and can’t go on the same rides as their family and friends. They wonder, "Why can’t I just get on and have fun like everyone else?" Rollercoasters have their dangers, but those dangers are minimal, they’re put into consideration when its drawn out and constructed. It’s built to maximize the safety of everyone. Dentist are just like rollercoasters. We look scary at first, but in the end you’ll walk out with a smile on your face and feeling better about your wellbeing. Dentist are not bad people. We aren’t here to rip out your teeth and laugh hysterically. We are here to give you the best oral care and treatment available. If you have a fear of the dentist, check out our tips below you can use to feel more comfortable during your dentist visits. Talk to your dentist! A universal rule to follow is to always express your concerns and needs. Your dentist isn’t a telepathic, he cannot read your thoughts. By expressing your worries, your dentist will be able to adjust his practice and his approach to your appointment, so you feel more comfortable and in control of the situation while being treated. Establish a ‘stop’ signal. Pushing yourself is one thing, but sometimes you will not be able to make it through an entire appointment without feeling a wave of nausea or discomfort envelop you. It’s a great idea to work with your dentist and create a stop signal. Doing so gives you the luxury to stop the procedure if you feel uncomfortable or just need a break and fresh air. Ask Questions! In order to get comfortable with your dentist, you got to be able to trust them. Your dentist should be able to answer all the questions that you have from them, from simple tasks to taking care of your teeth, to explaining in detail every step of a more complicated procedure. Visit the dentist regularly. This is the complete opposite tip you want to read, but it’s a great one. In order to counter any bad thoughts or experiences about the dentist, you got to have a positive outlook on the visit, and just have a good time. You’ll see your dental phobia progressively fade away with each positive reinforced dental visit. It’s a tall task to go in regularly, but doing so will benefit you the most. Relax! It’s important that you take the time to relax and clear your mind before a dental visit. If you are looking to reduce your fear of the dentist, this is the right approach. When you are scheduling a dentist appointment, set it for morning hours. It’s best to schedule for the morning, that way the stress that accrues during the rest of the day doesn’t scare you away from coming into your dental appointment. By practicing and utilizing these tips when going to the dentist, you’ll find going to the dentist much more approachable than ever before. You want to leave the dentist feeling awesome, not frightened half to death. If you are looking for an approachable dentist, check us out here at Smart Dental Implants. We look to provide affordable dental care for you, while making sure that you feel and look great when you walk out of our office. For more information and to see what we can do for you, give us a call, or schedule an appointment with us online today!